Pyramids! The word evokes an image of immense structures soaring upward from a vast ocean of sand three massive triangular faced monuments and a huge half-human, half-animal statue arbitrarily grouped together, parched by a searing sun and eroded by relentless winds. These are the pyramids of Egypt tangible enigmas, ancient remnants of a time beyond memory, beyond history, beyond understanding. Like lesser- publicized pyramids in other parts of the world, these colossal architectural edifices have, over the centuries, provided archaeologists, historians and mystics with material for thousands of volumes, numberless theories, endless debates. Today, the mysteries still continue to intrigue and plague scientists and scholars. Who built the pyramids? For what purpose? From where did the unknown builders acquire the extraordinarily advanced scientific and astronomical knowledge used to design these mammoth structures? And with what elaborate and complex technological equipment were these edifices created? These questions, while still unanswered, continue to pique the imaginations and curiosities of many. Theories have been developed by the score some highly bizarre, some remarkable only for their lack of intelligent consideration of the historical context with which the theorists are dealing books have been written, documentary and fictional films have been made, all dealing with the ever-fascinating subject of the pyramids. 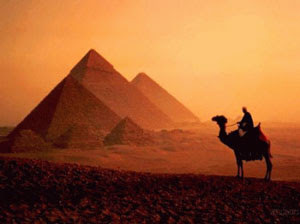 And although none of these authors, theorists or cinematographers has, to the best of our knowledge, come any closer than their curious predecessors of a thousand years ago to uncovering the secrets of the pyramids, still the search goes on. During the past hundred years, triangular tetrahedrons have been recorded with varying degrees of accuracy as to location. Most of these have been sighted by pilots flying over uncharted areas during their flight missions. Although a few of these unusual pyramids have been photographed, some of the pictures were subsequently lost or misplaced. Attempts to verify the existence of the rediscovered structures have been discouraged by impassable terrains and, ultimately, reports have depended entirely on eyewitness accounts and recording the legend of the natives close to the region. A big complex of pyramid structures with one large pyramid is apparently located in the Shensi provence of China. The complex is situated many miles west of the ancient Chinese capital of Sian-fu, a walled city older than Peking. The main pyramid is said to be over a thousand feet high and surrounded, within miles, by an unspecified number of flat-topped pyramids all of which are allegedly aligned to true north. The Shensi pyramids seem to be constructed from a mixture of lime and clay, hardened into a cement-like material; they are covered with casing stones and decoratively painted in various colors. Another Asiatic pyramid is located somewhere in the Himalayan Mountains. It is called the white pyramid and is described as shimmering white, encased in metal or some sort of stone, with a huge capstone made of a jewellike material, possibly a crystal. In the jungles of Cambodia lie the ancient ruins of the once great city, now known as Angkor, which contained splendid temples, endless galleries and vast pyramids. Cambodian history tells nothing of the origin of this sacred city. The oral tradition handed down through generations of Cambodians tell us only that it was either the work of giants or that of Pra-Eun, known as the king of angels. Although the imposing temple of Angkor Vat, the main structure in the abandoned city, has been studied and partly restored before the Indochinese conflict, very little is known about the local pyramids, except that their general proportions are similar to the Egyptian ones. said to have wiped out a flying saucer base but, because there was no mention of this incident in the Soviet press, all reports of the incident are regarded as gossip and will remain shrouded in mystery until the true story is known. Western Europe has its share of pyramid-like structures too. One such structure we found in the south of France. It is thought that this pyramid was built by the Knights Templar upon their return from the twelfth or thirteenth century Crusades. Beneath it is a subterranean pit with astrological symbols carved into the walls. Silbury Hill, in Wiltshire, England is one of many British cone-shaped mounds or stepped earthen pyramids. This hill is believed to have been constructed over 4,000 years ago. The builders used approximately a million tons of dirt, spreading it out over a five-acre base and stacking it more than 150 feet high. Ancient graves, capped with an earthen structure similar to Silbury Hill, have been found in Ireland. Usage of small pyramidal or conical markers for graves and for unknown religious ceremonies seems to have been a widespread phenomena in the Western Hemisphere where, especially the United States, many such mini-pyramids have been found. For example, near the small community of Williams, Montana, is a series of three-feet tall pyramids. The Montana Historical Society reports that these are possibly markers for some unknown band of shepherds. This explanation doesn’t seem to be completely acceptable, however. Even though these mini- pyramids were constructed along a northwest-southwest line, following the course and direction taken by the sheepherders, they appear to be several thousands of years old, and predate the appearance of the sheepherders by centuries.